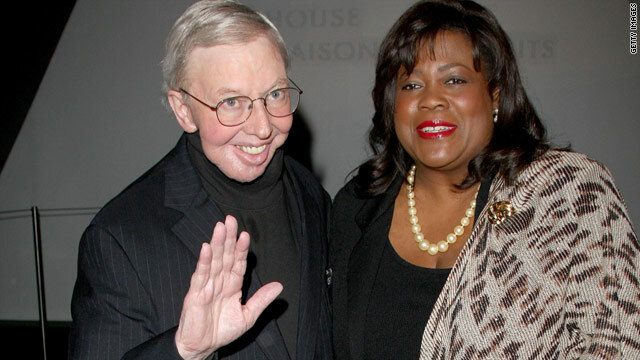 Roger Ebert and his wife Chaz Ebert attend a party for the "Precious" premiere at the Toronto International Film Festival in 2009. Ebert used a computer-generated voice resembling his own in an interview on "Oprah"
(CNN) -- Renowned film critic Roger Ebert hasn't been able to speak for the past four years, but that doesn't mean he's been silent. The Chicago-based author still pens film reviews, posts updates on his online journal, and offers his picks for the Academy Awards, as he did on Tuesday's "Oprah Winfrey Show," using a computer-generated voice that sounds remarkably similar to his own. Until recently, Ebert communicated with hand signals and monotone text-to-speech software. When Ebert sat down for an interview for Esquire magazine's March issue that chronicled his life since he lost his voice to thyroid cancer, he said he had used an English voice with his text-to-speech software, which he named "Lawrence." But "Lawrence" had a tendency towards odd phrasing and Ebert ultimately settled for something more generically American. At the time of the interview, he was still waiting on a Scottish company called CereProc to create a text-to-speech voice that would sound more like him. Last Friday, during the taping of Winfrey's show, Ebert took the new voice for a test run as his wife of 18 years, Chaz Ebert, sat beside him. When his voice flowed through the speakers, Chaz Ebert was moved to tears. "I think it's incredible," she said. "It's incredible that that's your voice." The last time she heard a sound similar to her husband's voice was July, 2006, she said. Roger Ebert believes the voice still needs some improvement, but called the similarity to his old voice uncanny. "This is the first version of my computer voice," he said, "but it still sounds like me." Ebert lost much of his jaw during his battle with thyroid cancer, and now that he's free from the disease, he told Winfrey he's done with surgery. "I'm not going to talk or drink again, so the surgery would be only to patch my face back together, and I don't want to go through that," Ebert said. "This is the way that I look, and I'm productive, so why have more surgery? ... No one looks perfect -- we have to find peace with the way we look and get on with life." For Winfrey, Roger Ebert's other half has been just as inspirational. "I remember when Roger was going through those early surgeries, and from one woman to another, you are incredible," Winfrey said, recalling when Chaz Ebert said she refused to let her husband die. "She's stood by him and been with him and taken care of him, and she's shown what true love is." The past few years have been "very, very intense," Chaz Ebert said. "He's smart, he's funny, he's respectful of women, appreciative of other cultures -- I didn't want to lose him," she said of her husband. "I refused to give up." And now, after a number of surgeries and years of relying on a voice that sounded nothing like his own, Ebert was able to use his personalized voice to do what he does best: Present his picks for the Oscars. Ebert told Winfrey he believes Mo'Nique will win best supporting actress for her role in "Precious," and that Christoph Waltz will win best supporting actor for "Inglourious Basterds." For best actor, Ebert is putting his money on Jeff Bridges for his role in "Crazy Heart," and is going with fan-favorite Sandra Bullock for best actress for her performance in "The Blind Side." "I can't remember a year when it's been easier to predict the Oscars," Ebert said. The one category he said he considers questionable is best picture, which he believes will go to Kathryn Bigelow's "The Hurt Locker." He also said he thinks Bigelow will take home the Oscar for best director. Roger Ebert's strength through a trying time was evident in a journal entry of his that his wife read aloud: "[If], at the end of it all, according to our abilities, we have done something to make others a little happier, and something to make ourselves a little happier -- that is about the best that we can do."